The Nigeria Labour Congress (NLC), Gombe State Council, has applauded the National Assembly's speedy passage of the bill proposing N30,000 as the new national minimum wage. 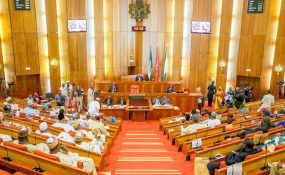 The Senate had on Tuesday approved N30,000 as the new national minimum wage, after its ad-hoc committee on new minimum wage submitted its report. Haruna Kamara, the state's NLC Chairman, gave the commendation in an interview with the News Agency of Nigeria (NAN) in Gombe on Wednesday. He said that the gesture by the lawmakers was a testimony to their high level of patriotism and commitment to the well-being of workers. He added that such patriotism and commitment could lead to the desired improvement in the living standard of workers. "I want to most sincerely thank and commend the National Assembly for the honour done to Nigerian workers which will bring the desired change in terms of improving the living condition of workers generally. "We are highly elated with the high level of humility and patriotism exhibited by the National Assembly. "By their act, the deal has been done and sealed for transmission to the president for assent. "We must also give credit to labour leaders and Mr Ayuba Wabba, for putting the mechanism in place for the change that the Nigerian worker will be grateful happened at a time like this," he said. The Gombe NLC chairman debunked speculations that the speedy passage of the bill had anything to do with the just concluded elections. "The lawmakers have realised that workers are the engine room for development. "The approval of the new wage for workers by the lawmakers shows that they see workers as the most effective tool for change and as major players in driving the economic development of the country," he said. Mr Kamara who expressed confidence in President Muhammadu Buhari's disposition to sign the bill into law soon, said: "I believe that President Buhari is committed to improving the welfare of workers and pensioners nationwide. "Mr President has shown on several occasions his commitment to workers' well-being. "So I believe he will demonstrate that same commitment and high-level patriotism by signing the bill into law." On whether governors will pay the new wage, Mr Kamara said: "When Mr President assents to the bill, the governors will have no choice but to pay. We will ensure that the N30,000 is implemented nation-wide. NAN reports that Mr Buhari had on November 27, 2017 inaugurated the National Minimum Wage Committee headed by Amal Pepple, with a mandate to recommend a new minimum wage for workers.